A 4′ gate is included with every order of $3,000 or more. 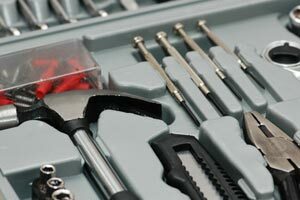 Modular design for easy DIY installation. Complete step-by-step instructions included. 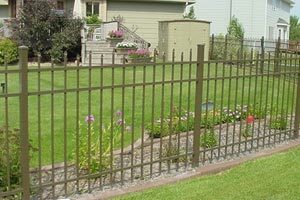 Jerith aluminum ornamental fences are easier to install than almost any other type of fence. Their modular panel design and simple assembly process make them ideal for Do-It-Yourself or DIY installation by homeowners and property owners. Complete installation instructions and all necessary hardware come with every package from Jerith, and gates and accessories have their own installation instructions. While a Jerith aluminum fence can be installed by a single worker, DIY installation goes much faster with two workers. The time required for DIY installation depends on the length of the fence, the grade of the property, and the skills and experience of the installers. We provide excellent after-sale support to help our customers with any installation questions. Check with local agencies for fence code requirements and arrange for location of pipes, wires, and other utilities, both public and private. Lay out area with stakes and string, with the string located at the outside edge of posts. Mark post hole locations at intervals specified in the detailed instructions. Dig post holes to the depth and diameter specified in the detailed instructions. You can dig all post holes at one time or as installation proceeds. For long fences, consider renting a power auger at a local equipment rental agency. It will save much time and hard work. Install aluminum gate posts first, spacing them according to the dimensions in the gate installation manual. Work out from gates. Mix Concrete to a stiff consistency and fill the post hole, leaving 2-3" of space at the top. Concrete must extend below the bottom of the post. Place a Post in its post hole, aligning its outer side with the string, then insert the rails of an aluminum fence panel completely into the post. 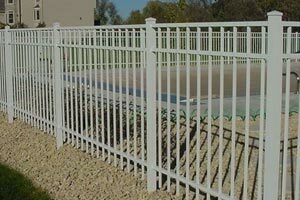 Aluminum fence panels can be raked to comply with a sloping grade. At corners, fence rails must be mitered at 45 degrees. Fence panels can be trimmed for shorter sections, with the rails notched properly to fit the posts. Install the next post, inserting the fence section rails fully into it. Fasten posts to rails with the included self-drilling screws. Plumb and Level Posts, using a bubble level and long straightedge. Brace posts as necessary and recheck posts behind you frequently until concrete sets. Also, sight back down the fence as you work to spot misalignments. The more checking you do, the better your completed aluminum fence will look. Continue Installation, following the same procedures, working carefully and checking fence alignment behind your current position regularly. Attach End Posts to walls, as needed. Install Aluminum Gates & Ornamental Accessories, following the included detailed instructions to install finials and other accessories. Our discount fence supply company is proud to offer Jerith ornamental aluminum fences to DIY fence builders all across the country. Jerith aluminum fences are ideally suited for DIY fence installation and come with detailed package instructions to help you build a great fence. Jerith’s ease of installation and modular construction mean that you can install these fences yourself and save. As a leading fence supplies company, we offer the most competitive prices on all aluminum fence materials, including panels, posts, and gates. Our direct shipping reduces your shipping cost by more than half. Contact us to discuss your fence project or request a price quote of how much your new fence costs. We’ll help you build a complete materials list for your project, so you can get started building a great fence right away, and complete it with no delays for missing components.